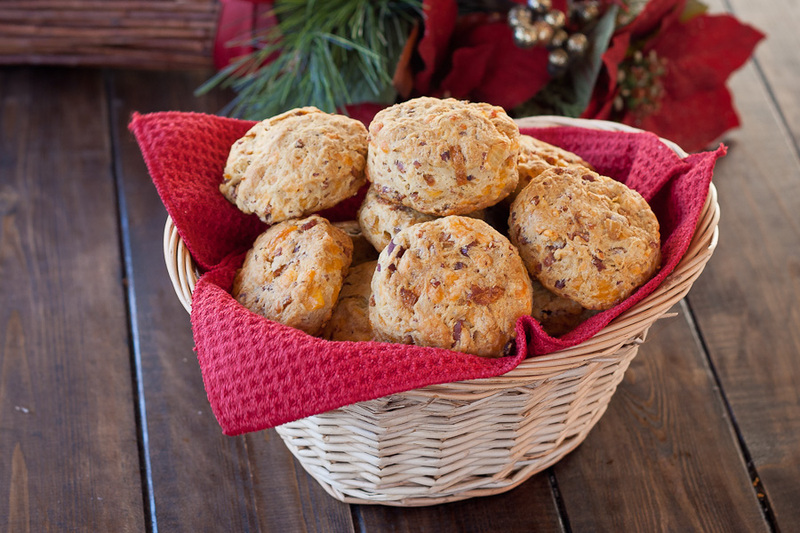 Cheddar biscuits are one of my faves and that gives me the excuse of trying all sorts of new combinations when baking them. They are versatile as you can add any weird ingredients you can think of, but this time I wanted to stay classy, so I used a very old friend of mine… bacon! These things are great for breakfast or whenever you just need a snack and they are very filling. I added some onions as well to this recipe, but if you are not a fan you can let it out, though you will miss a great flavour. Get about 10 slices of bacon, fry them and cut them into little pieces. Caramelize half of onion, cut into little pieces as well. (not shown in this post because onion is boring heh). Make sure you don’t fry the onion too much, just until it becomes translucent. In a large bowl, add 2 cups of flour, 1½ tsp baking powder, 1 tsp of salt and mix well. To this mixture add ¼ cup of butter cut in small pieces. Using a pastry cutter or two knives start cutting into the butter. Use your hands if you have to but continue until mixture resembles small peas. In a small bowl add ½ cup of milk, 4 tbsp of oil and 1 egg. Mix the wet ingredients together and add to the flour mixture. After everything is well incorporated add the bacon and onions. Serious mixing again, use your hands if you have to, until well incorporated. Roll out the dough so that it’s about ½ inch (1cm) in thickness and use a 2 inch (5cm) cookie cutter, or if you don’t have that, just use a glass to cut out the biscuits. Fry the bacon then the onion. Chop up the bacon in small pieces. In a large bowl mix the flour, baking powder, and salt. Using a pastry cutter or 2 forks, cut in the butter until it is mixed in well. In a small bowl mix the milk, egg, and vegetable oil then add the wet ingredients into the flour mixture. Add the bacon, onion, and cheddar to the mixture and mix everything well together. Take big spoonfuls of dough and fill a muffin pan that’s been well buttered and bake for 25 min. This recipe yields 15 biscuits. Cheddar cheese PLUS bacon = Heaven! 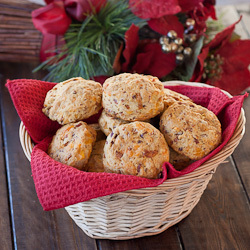 This recipe is totally awesome and your biscuits look really appetizing. 6 of them and you could consider that a meal!